Avery Name Badge Label - 2.33\" Width x 3.37\" Length - 8/Sheet - Removable - 400 / Box - White - Welcome to TABS! 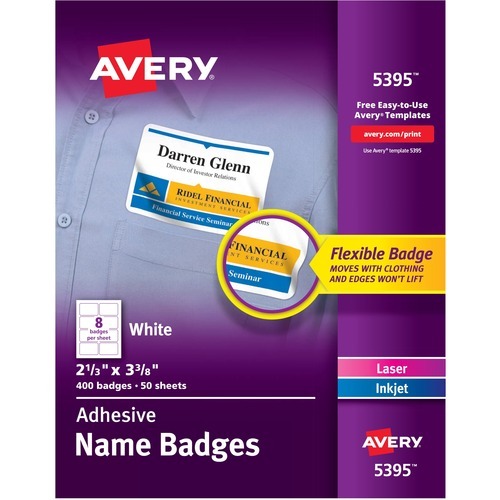 Create professional-looking name badges instantly with a laser or inkjet printer. Self-adhesive labels adhere firmly and remove easily. The 8-1/2\" x 11\" sheets feed automatically from your printer's paper tray. Each sheet has eight labels. Each 8.3 mil thick badge measures 2-1/3\" x 3-3/8\". Durable adhesive is safe for most fabrics, but is not recommended for vinyl, plastic, leather, suede, velvet, corduroy, silk and other delicate fabrics. Create professional-looking name badges instantly with a laser or inkjet printer. Self-adhesive labels adhere firmly and remove easily. The 8-1/2\" x 11\" sheets feed automatically from your printer's paper tray. Each sheet has eight labels. Each 8.3 mil thick badge measures 2-1/3\" x 3-3/8\". Durable adhesive is safe for most fabrics, but is not recommended for vinyl, plastic, leather, suede, velvet, corduroy, silk and other delicate fabrics. Avery offers many easy-to-use templates for Microsoft Word and other popular software programs.